There may be no shortage of mommy jewelry on the market, but Heart and Stone Jewelry offers custom designed, eco-friendly charm necklaces and personalized rings that are made from 100% recycled silver sourced from X-rays, electronics and film stock — elevating these wearable keepsakes to cherished pieces of green artwork that you design yourself! 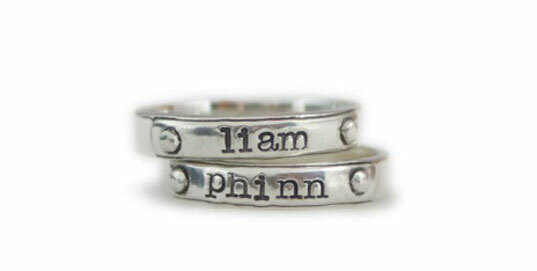 Designer Julie Booras handcrafts each one-of-a-kind piece based on your individual wishes and tastes. The Heart and Stone website features a “wish list” option so shoppers may fashion their own jewelry and email the completed necklace or ring of their choice to Julie. The experience is fun and rewarding, and it results in an original creation you will truly love. I had a blast designing my own necklace on the Heart and Stone Jewelry website, choosing from an array of gorgeous options which included customizable charm separates in a variety of shapes, symbol charms which enable you to express your personality with options from paw prints to lotus flowers, precious and semi-precious gemstone drops or large birthstone charms, as an homage to your child’s birth month, and mini-tags which may be engraved with a special date or meaningful word. 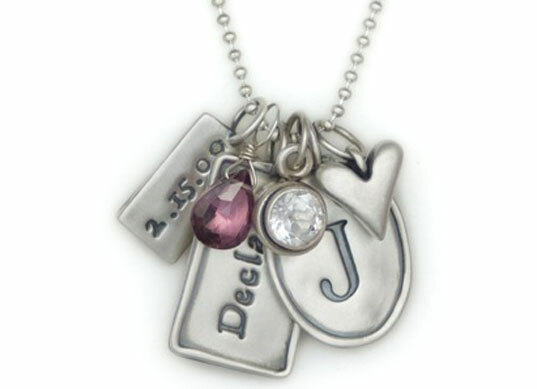 I chose to have my daughter’s name engraved on the front of an organic name charm, with her birth date engraved on the back, I added a semi-precious gemstone drop to commemorate her birth month, and I added the love charm with my wedding anniversary date engraved on the back, and a heart symbol charm to top it off! I love that my necklace is dainty, feminine and elegant, while being an expression of my most cherished gift in life, my family. Heart and Stone also opens up the personalized jewelry market to dads with the Men’s Rivet Ring and the Men’s Custom Necklace. Both would make amazing Father’s Day gifts for doting dads. There may be no shortage of mommy jewelry on the market, but Heart and Stone Jewelry offers custom designed, eco-friendly charm necklaces and personalized rings that are made from 100% recycled silver sourced from X-rays, electronics and film stock -- elevating these wearable keepsakes to cherished pieces of green artwork that you design yourself! Designer Julie Booras handcrafts each one-of-a-kind piece based on your individual wishes and tastes. The Heart and Stone website features a "wish list" option so shoppers may fashion their own jewelry and email the completed necklace or ring of their choice to Julie. The experience is fun and rewarding, and it results in an original creation you will truly love.